THERE ARE TWO LOTS LIKE THIS NEXT TO EACH OTHER. 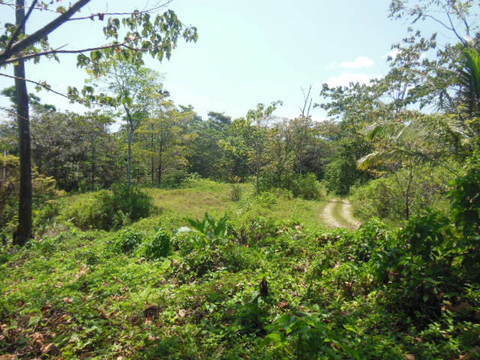 One acre titled lots 10 and 11 have just been reduced to $20k each. You can walk to the Carenero surf breaks. These are beautiful beachfront lots with a hilltop building site that affords the viewer an incredible and unobstructed view of the Caribbean. Less than 5 minutes by boat from Bocas each lot has its own boat slip and there is an on-site caretaker who maintains the pathways. Each lot has access, through a series of pathways and roads, to the entire property including its hiking trails and beaches. 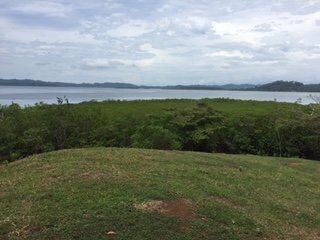 The combination of beachfront, hilltops, boat slip and being so close to Bocas when combined with the fact that the property is titled make this an excellent value. The home association does not allow commercial businesses, however you can rent out your house and a guest cabin. Owners say bring offers now. Titled Waterfront And Jungle Preserve With Cabin – Loma Partida Beautiful Elevated Waterfront Great Build Sites – New Price!